First, a confession: we completely overindulge our children. There is no doubt in my mind that they have too many legos, too many clothes they don’t wear, too many games they don’t play and too many craft projects they will never ever get to. I could rationalize why we over provide for them, but the truth is it doesn’t really matter. It makes us happy, the children aren’t spoiled and eventually the winner is the resale shop and the not-for-profit it supports. So yes, as long as the children aren’t spoiled and we’re not driving ourself into financial ruin, the only problem that remains is where to put all of this stuff. We have a hundred-year-old-house with only two closets and small room sizes. Attempt number one: we finish off the attic and turn it into a playroom/family room loaded with storage for books, games, toys and the like. Children’s response? It’s so far atop the house (it is the third floor) that they don’t like being up there alone and toys eventually migrate downstairs to be played with in the living room. Move on to attempt number two: Move hundreds of legos (and some games) one floor below the main floor into the unfinished basement along with a TV, karaoke machine, drum set, keyboard and floor mats for impromptu concerts and wide open play space. Children’s response? It’s creepy down there and (shudder) the spiders. 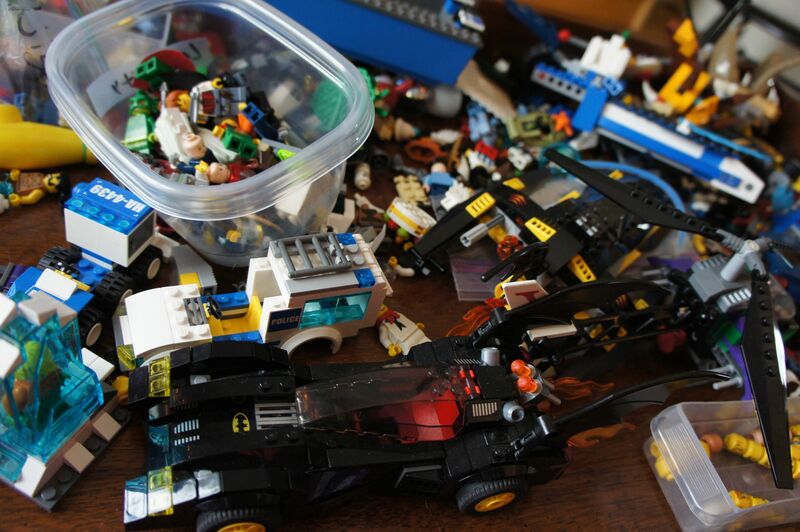 So masses of legos eventually migrate upstairs into the living room to be played with. Despite our best attempts to corral the toys they always end up underfoot in our main living room. Maddening? Yes, but we happily tolerate it. Why? For our children, at least, as much as they love their toys and the space to play and be creative, what they love most of all is being part of something – being near the action and the comfort of their parents and the activity and chaos of being a family. My children are getting older. Soon enough, there will be days where they’ll be stomping up to their rooms, slamming their doors and demanding privacy. So for now, I’ll spend a few minutes each evening picking up the legos from the floor, collecting the stuffed animals from the sofa and returning the crayolas to the craft drawers in the closet, all the while enjoying the fact that they are proof of something much larger that happens in our small home everyday. This entry was posted in Life Lessons, Parenting and tagged living in a small house, spoiled children. Bookmark the permalink.